Cold beers and hot days are at odds. At the end of a long summer hike, it'd be nice to relax with a cold, but by the time you've humped it down a trail, the beer or soda is never frosty or fizzy. Will this bottle save us from drinking beer-flavored bathwater? It's Friday afternoon, you've made it through the long week, and it's time for Happy Hour, Gizmodo's weekly booze column. A cocktail shaker full of innovation, science, and alcohol. Y'all got go cups? It's a 32-ounce insulated bottle designed to rid a beverage of heat and flatness. 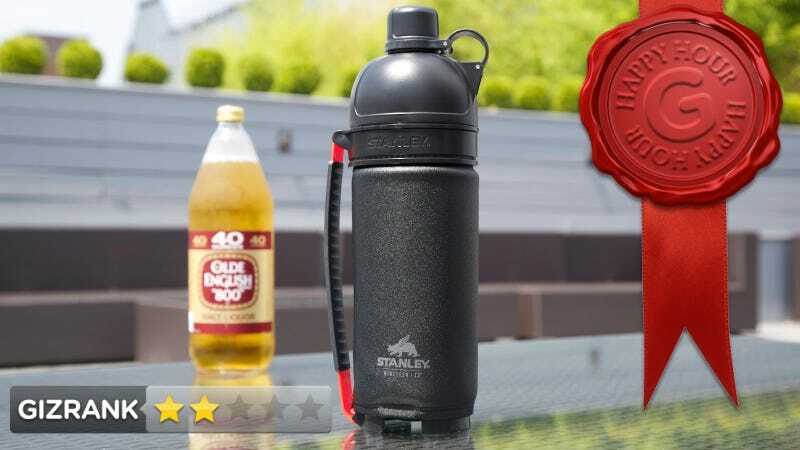 Outdoor beer guzzlers and hot weather soda sippers. The domed bottle screams "Thermos." But there is no double-walled insulation. It's plastic with a foamy wrap around it. You pour cold suds in, seal the lid, and head out. Its domed design counteracts Henry's Law, thus maintaining proper fizziness. After several hours—overnight, even—soda and beer never really got flat. It doesn't keep a drink cold. At all. We poured in 32 ounces from a 40 of Old E. It measured 49.2 degrees F when first sealed, then we left it outside in the shade on a 90-degree day. Two hours later, the beer was 70.9 degrees. Total fail. Stanley's product engineers refined the design by spending hours watching patrons fill Big Gulps at a local soda fountain. In the test mentioned above, beer in an uninsulated glass bottle rose to a temperature of 84 degrees F—a 12-degree difference. We repeated the test with water starting at 41.3 degrees F. After 2.5 hours, the glass bottle reached 85.7 degrees. The Stanley bottle rose to 70.2. The bottle is supposed to be "sweat-proof," and indeed, all of the sweat was contained unter the foamy wrap. No drips. Storing it upside down in a backpack begat no leakage. It's a lot bigger and heavier than a Nalgene bottle with the same capacity, making it much less backpack-friendly without the insulation performance to justify it. The build quality is excellent, and it doesn't feel like it'd break easily. You can't use it for hot beverages. Love the design of the top. The double-hinge on it works extremely well. A stiff plastic leash keeps the cap from smacking you in the face while you drink.